Take a look at the map and use a little detective work to figure out which photos match each of the numbered locations on the map. To give you an idea how this thing works, we went ahead and filled out the first one for you! The Big Wins Day City-Wide Photo Hunt begins on Wednesday, November 28, 2018 and ends on December 31, 2018. Completely fill out the answer sheet and turn it in to us at the Clovis Tourism and Visitor’s Center at Tarpey Depot. 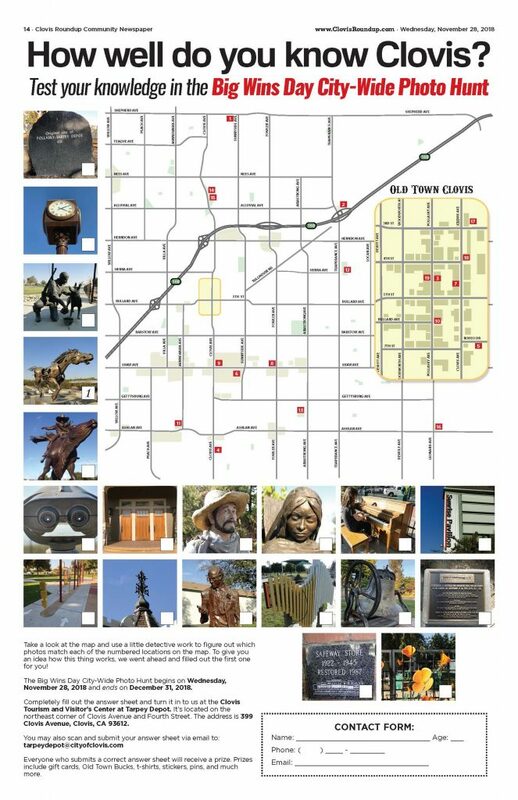 It’s located on the northeast corner of Clovis Avenue and Fourth Street. The address is 399 Clovis Avenue, Clovis, CA 93612. Everyone who submits a correct answer sheet will receive a prize. Prizes include gift cards, Old Town Bucks, t-shirts, stickers, pins, and much more.